David Phinney's Department 66 - Write for Wine: It's Wine O'Clock Somewhere!Write for Wine: It's Wine O'Clock Somewhere! Winemaker David Phinney made his mark with The Prisoner, a best-selling and widely recognized Napa Valley red blend of Zinfandel with the unlikely mix of Cabernet Sauvignon, Petite Sirah, Syrah and Charbono. A couple of years ago, Phinney sold The Prisoner to beverage giant Constellation Brands for $285 million. He then turned more attention to another grape. Back in 2008, Phinney purchased 40 acres of old-vine Grenache in a steep, hillside vineyard in Maury in southern France, an area designated as Department 66. The following year, he began building a winery on the old-growth site near the Mediterranean coast. He now owns more than 300 acres of vineyards of Grenache, Syrah, Mourvedre and Carignan, in what he calls an amazing area of raw beauty. From these old vines, he has created three new releases under the label Department 66: a rosé, a red blend and a Grenache. We received samples of these wines to taste. What a pretty wine. The blend of Grenache topped with Syrah and Carignan is salmon in color, with fragrant aromatics of rose and honeysuckle, leading into flavors of stone fruit and red berries, and a pink grapefruit finish. Matured in 100% stainless steel, mineral notes makes this a refreshing drink of summer. Or you could pair it with Asian fusion or Tex-Mex dishes all year round. This red wine blends all the grapes grown at the vineyard: Grenache, Syrah, Mourvedre and Carignan. Others features aromas and notes of dark fruits including blueberries, marion berries, blackberries and plums, with spice and herbs too. Pair with beef dishes, pasta, lamb or poultry. Awarded 93 points from Robert Parker, this is a rich, vibrant blend of Grenache (80%), Syrah (15%) and Carignan (5%). High-intensity flavors of blueberries, blackberries, red berries, cassis and spices are followed by notes of earth, cedar, herbs and stone. But this wine, with its high alcohol content of 15.2%, is big and concentrated, begging for ribs, steak or other roasted meats and vegetables. Be sure to decant it for an hour or more before drinking. If you like Grenache, give these three D66 wines a try! 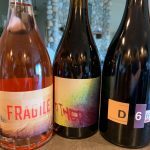 This entry was posted in France, Grenache, Mourvedre, Petite Sirah, Syrah, Wine and tagged Carignan, D66, David Phinney, Fragile Rose, Grenache, Mourvedre, Others Red Wine, Syrah by Margot. Bookmark the permalink.